Whispers in the Loggia: "Do or Die"
In 1992, Cardinal Bernard Law famously called down "the power of God" on the Boston media, "particularly the Globe," over its dogged coverage of the region's first public case of a predator priest. Nine years later, the paper's "courageous, comprehensive" reporting on abuse in the Beantown church itself opened the floodgates of the most devastating scandal American Catholicism had ever known, paving the way to Law's resignation in disgrace and earning the broadsheet the 2003 Pulitzer Prize for Public Service. Boston Globe management was continuing to negotiate concessions with its major unions well past a midnight deadline, but said it was prepared to file a plant closing notice with the state today if they failed to reach agreement. That would allow the paper's owner, the New York Times Co., to follow through on its threat to shutter the 137-year-old newspaper. Talks had intensified after Globe management, just before 10 p.m., issued an ultimatum to its four major unions: Agree to major financial and contract concessions, including the abolition of lifetime job guarantees for some workers, or the Times Co. would begin the shutdown process. "We have provided our unions with a copy of a notice that we are prepared to file tomorrow if we are unable to reach an agreement by the midnight deadline," Globe spokesman Robert Powers said yesterday. "This notice is required under the Worker Adjustment and Retraining Notification Act, which requires 60 days advance notice before the closure of a business. Filing the WARN notice is a difficult step that we would like to avoid but, unfortunately, given the state of the negotiations, it is one we must be prepared to take if negotiations are not successful." If the notice is filed, Powers said, the paper would continue to publish through the 60-day period. In addition, according to state labor officials, such a notice is not irrevocable. At times, financial conditions change during the 60-day period and companies don't go through with the plant closing. The ultimatum, issued shortly before 10 p.m., came after just over a month of intense negotiations with unions over $20 million in financial givebacks and concessions on contract language, particularly the elimination of the job guarantees that apply to about 450 union workers. It was issued after Globe management summoned union leaders to the offices of the Labor Guild of the Archdiocese of Boston, where negotiations had been underway with the paper's largest union, the Boston Newspaper Guild. The Guild, in a statement, decried the management move: "This tactic, while expected, is representative of the bullying manner in which the Times Company has conducted itself during these negotiations. Despite the Company's hostile tactics, we continue to negotiate in good faith and work diligently toward an acceptable outcome." 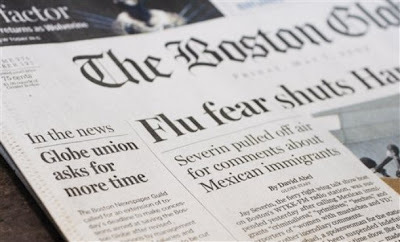 The Globe is projected to lose $85 million this year without significant cost reductions, according to the Times Co. Like many newspapers, the Globe has been hit hard by the migration of readers and advertisers to the Internet, and by the nation's deep recession. As the midnight deadline approached, union officials said they had essentially agreed to the $20 million in financial concessions that the Times Co. was seeking. The Guild, in a statement, said the union had "presented the New York Times Company and Globe management with a proposal that exceeds the $10 million in cuts demanded. This proposal was the product of arduous deliberations. These tremendous sacrifices, across virtually all categories of compensation and benefits, are more than adequate to continue The Boston Globe's mission of quality journalism." A source close to the union said the Guild proposal included cuts in 20 different pay and benefit categories. But the key issue still dividing management and unions was the elimination of the lifetime job guarantees, a step that management has sought since the start of the bargaining, and which would give management substantially more flexibility in reshaping the newspaper and shrinking its staff in the face of declining advertising revenues. Advertising revenues for the Times Co.'s New England Media Group, dominated by the Globe, declined by more than 30 percent in the first three months of this year from the same period in 2008. To be sure, the changing face of media hasn't left the Catholic press unscathed, either -- around the country, more diocesan papers have either cut staff, work-hours, editions or coverage than haven't, while the house organ of Wyoming's diocese of Cheyenne folded last month and, among others, Knoxville's East Tennessee Catholic is exploring reader interest in going electronic-only. Strange, rough days in the business, gang. And as these pages are far from immune in the storm, thanks to everyone whose support keeps the feed coming your way day in and day out.